Welcome to Wine Country Cabins Finger Lakes Bed and Breakfast on the shoreline of Seneca Lake. Wine Country Cabins is a modern Inn, with rustic charm. As a couples-only Bed and Breakfast we are dedicated to providing a romantic getaway for couples who need to relax, find good wine, and kindle or rekindle some romance. We are located along the eastern shoreline of beautiful Seneca Lake in Lodi, New York. In the spirit of a Bed and Breakfast, your hosts prepare breakfast in the main house every morning. You get all the comforts of a B&B, the convenience of an Inn, and all the privacy of your own secluded log cabin with private bathroom. Wine Country Cabins is perfect for couples who like the idea of a Bed and Breakfast, but also want their privacy. We are open from mid-April to mid-November which are ideal times to visit the Finger Lakes and her wineries. The Finger Lakes offer beauty, tranquility, history, and of course, wine. We would love to be your home away from home as you relax and enjoy any or all that the Finger Lakes have to offer. As our guests, we can help you arrange for anything you'd like to do while in the area. As a Bed and Breakfast located in the center of the region, it is very easy to access everything in the Finger Lakes. After making your reservation to stay at our bed and breakfast , please browse our Things To Do section for the New York Finger Lakes' most complete guide to what's available in the area. Wine trails, hiking, site seeing, canoeing, antiquing, fine dining...it's all here on Seneca Lake or the neighboring Finger Lakes! 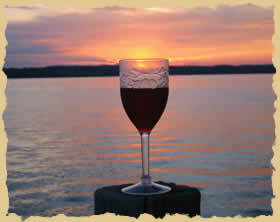 Enter our Finger Lakes wine at sunset photo contest and win a bottle of Finger Lakes wine. Wine Country Cabins Bed & Breakfast• • Lodi, NY • Sorry. Wine Country Cabins is no longer open.